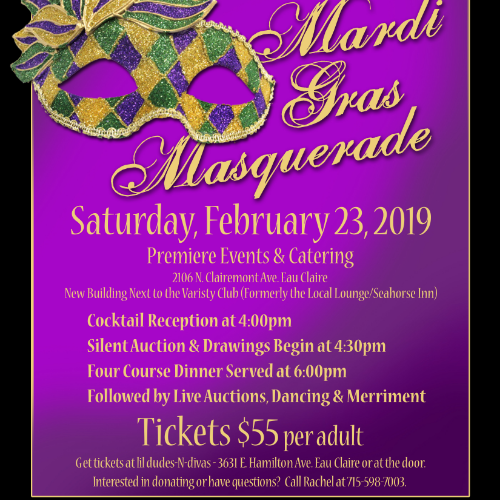 EVERY parent deserves a night out, and what better way than Mardi Gras style! 21+ Event-Recommended Attire: Cocktail Elegant Attire with awards for Best Dressed Couple, Best Mask, Best Shoe Wear and SO much more! Enjoy an evening of drinks, merriment and dance with All Occasions DJ Service! Treat yourself to a 4 Course Meal catered by Premiere Catering & Events! Games, Prizes, Auctions and Giveaways throughout the ENTIRE evening! Guest can vote for their favorite Child Care Center in the Chippewa Valley! The top 3 votes are awarded a check of 5% of the proceeds EACH! This is an annual event that will mark the importance of quality child care in Chippewa Valley and put your support back in to the community!